The prophet, then, is one who has directly encountered the God/Goddess, -in the form of transpersonal awareness. This is not necessarily a fore-telling of the future, but can also be the teaching of a social message. The sociologist Max Weber distinguished two types of prophets: the emissary who conveys a message –generally of the future, and the exemplary who teaches social lessons from direct experience (history). I contend that it is possible to do both, though not always at the same time. Similarly, Robert Hand asserts that it is the responsibility of the Mundane Astrologer not simply to predict, but like the biblical prophets, to try to get the nation to change its behavior by pointing the way to better resolutions. One of the strongest references for a Zodiacal relationship with prophecy is the Christian Bible. Both Old and New Testament prophets invoked prophecies with Zodiacal parallels. Ezekiel saw four-faced cherubim which had faces of the four fixed signs of the zodiac: bull (Taurus), lion (Leo), eagle (Scorpio) and man (Aquarius). 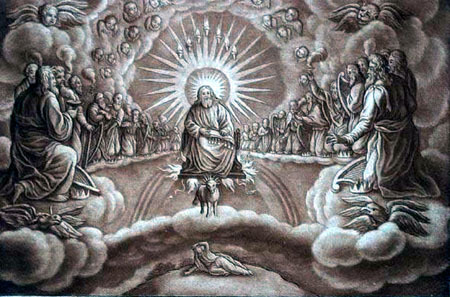 Similar interpretations of John’s vision in Revelation IV 6-7 have been made. Persian mythology gives their 4 brightest stars special significance. The 4 Royal Stars of Persia: Antares, Aldebaran, Regulus and Fomalhaut – each promise both glory and potential destruction vividly illustrating the duality between light and destruction interwoven into the earthly journey. Great glory is promised -if you can overcome the nemesis which can destroy. Aldebaran in Taurus (the Bull), Regulus in Leo (Lion), Antares in Scorpio (or Eagle), and Fomalhaut in Aquarius (Man): These are the four creatures which combine to form scriptural cherubim. These four stars bright stars are arranged in the four corners of the heavens –and represented the mid-points of what have now become the four fixed signs of the tropical zodiac. Tropical probably arrives from Greek tropos –meaning to spin or turn. The Tropical Zodiac which evolved is a fixed geo-centric (earth centered) coordinate system based on the seasonal Solar “turning points” of the equinoxes (from the Latin words aequus (equal) and nox (night) meaning a time of equal length night and day) and solstices (from Latin Sol =Sun and sistere -to stand still –as the Sun reaches its highest or lowest declination or angle in the sky). There is evidence to suggest that ancient astrologers actually found the middle of a sign to be most important. A clear understanding of the power of the mid-points of the fixed signs in the modern tropical zodiac can be seen in the Celtic Sabbats. These “cross-quarter holidays,” as they have become known, celebrate the passage of the Sun through the middle degrees of the fixed signs –and thus mark the “cross-quarter” –or mid-point between the solstice and equinox. The Celtic year began at Samhain –celebrated today as Halloween. Ken Gillman says: “It was …the most perilous joint of the year. The dead were honored, divination was practiced …and ritual fires were kindled.” This was regarded as a holy season when the barriers between worlds are down, when the dead, gods and strangers from the Underworld visit. “It is a time that is not a time, on a day that is not a day, between the worlds, and beyond.” As we can see, a connection with prophecy can be assumed. As Maurice Fernandez pointed out in the Aug/Sep issue of TMA, the Wheel of Fortune –card #10 of the Major Arcana, again invokes these same four symbols of the fixed signs–each appears to be reading from scripture (in the Rider/Waite deck). He goes on to point out that the fixed signs represent individual power, resourcefulness and creativity and call for responsibility in life management. That reminds me of the exemplary prophet who teaches social lessons –presumably to increase responsibility. The Marseille deck actually pictures the sphinx-like and demon-like figures as one -again sitting atop the wheel. Around the wheel rotate but two figures, Anubis and Typhon –representing positive/integrative factors and destruction/disintegration respectively. Another perspective on this duality would be the yang urge to dominate and organize and the yin tendency to receive and contain. Or in astrological terms, the positive air/fire signs and the negative earth/water (read positive/negative here in terms of charge –similar to electricity). Again I am reminded of Weber’s emissary and exemplary prophets. So, from the four faced cherubim in both Old and New Testament Prophecies, the Royal Stars of Persia, the Celtic Sabbats, to The Wheel of Fortune in the Tarot –Myriad ancient Symbols point to the Power of the Fixed Cross in the Tropical Zodiac and suggest a connection with the power of prophecy. If this connection with prophecy is true, we should be able to see the residence of planets in the mid fixed signs of people considered to be prophetic “proclaimers.” While some may look toward more religious figures, my interest in music led me to investigate this theory in terms of some of the musical figures who made their mark on my way of thinking and relating to the world. When looking at the charts for 60’s Rock & Roll bands, I found some interesting parallels to the afore-referenced symbolism. Biblical scripture tells us to judge a prophet “by their fruits.” I take this to mean that we can assess the quality of the prophet not only by the content of their message, but by the message’s impact. Judging simply by “fruits” in terms of number of records sold, The Beatles remain the best-selling act of all time -and their message was predominantly that of Love -Jesus' 11th commandment. We see all four of the fixed signs occupied in the central degrees –using orbs of 6 ½ degrees. An abundance of planets mark mid-Taurus: John’s and Ringo’s Jupiter/Saturn as well as Paul’s Venus. Paul’s Moon is smack in mid-Leo. Only in Scorpio do the orbs stretch a bit. John’s Mercury is barely past 8 ½ degrees Scorpio. While some may argue here, I go with what works. I’ve attended a Halloween parties at least a couple days prior. I don’t think anyone could call me crazy for seeing John Lennon as a prophet –both Taurean/Venusian and Scorpionic/Sarcastic. George’s Mercury in Aquarius rounds out the mid-points of the four fixed signs. The longest lasting title would definitely have to go to The Rolling Stones. While not achieving the all-out commercial success of the Fab-Four, (perhaps due to the death of their Aquuarian member) the Stones have continued rocking well into their 60’s. Mick Jagger, the vocalist, has his Mars in mid-Taurus and Ron Wood’s Venus is there as well. Brian Jones’ Moon was at mid-Leo as well as Mick’s Mercury and Ron’s Pluto. Keith Richards’ Venus shows itself in mid-Scorpio (it’s just as wicked as it seems y’all) as well as Ron’s Moon. While the Stones don’t have more planets in mid-fixed signs, their orbs are closer than for the Beatles. Perhaps this is why they lasted longer -even after the death of their founding member. A very interesting study is Crosby, Stills, Nash and Young. Not only does Neil Young’s Scorpio Sun complete the four elements by Sun signs for the group –but it also fills in the hole in mid-Scorpio that the other three have lacking. Accordingly, Déjà Vu, their only album with Young -is considered to be the group’s best work. There’s a plethora of planets at the other mid-fixed signs; however, indicative of the group’s overall relative stature despite comparatively little studio work produced. At mid-Taurus we have Crosby’s Moon and Nash’s Mars and Saturn. At mid-Leo we have Crosby’s Sun and Mercury, Stills’ Pluto, Nash’s Moon, and Young’s Pluto. At mid-Aquarius we have Nash’s Sun/Venus and Young’s Moon. 6 of 8 Lights are involved! Morrison had enough mid-fixed energy to drive the Blue Bus anywhere he wanted. The only sign lacking was, oddly enough Scorpio, filled in by Ray Manzarek’s N. Node –reminiscent of their chance meeting on Venice beach. Ray’s Uranus also joins Jim’s Moon at mid-Taurus. John Densmore, Robby Krieger, and Jim all have Pluto in mid-Leo –as well as Jim’s N. Node. Ray’s Mercury and Sun join Jim’s Asc and S. Node in mid-Aquarius. As the first group to bring in the Nodes, it is interesting to note they are the only ones to have a modern day popular movie devoted to them thus far. It was also noted by this astrologer that some other groups -who either didn’t last as long and/or didn’t quite have the massive popularity/commercial success of the others- were the ones lacking occupancy of the complete set of four fixed sign mid-points (e.g. The Who were missing Taurus -The Grateful Dead were missing Aquarius). However, it was also noted that the longest lasting band of the current generation’s Grunge Rock explosion, Pearl Jam -continues this theme. Their vocalist, Eddie Vedder, has Jupiter at mid-Taurus. The rhythm guitarist, Stone Gossard, has Mercury at mid-Leo. Bassist Jeff Ament anchors the group with his Saturn at mid-Aquarius. All four band members, including lead guitarist Mike McCready, share Neptune at mid-Scorpio -the same position as the Sun of Neil Young -the "godfather of grunge"! The band has served as a catalyst for independent thought, from their boycott of Ticketmaster to support for a third political party and for important literary works. The bands 1998 release “Yield” was inspired by Daniel Quinn’s novel Ishmael. Dane Rudhyar Culture, Crisis and Creativity. 1977. Theosophical Publishing House -pg.194. Robert Hand, “The Mundane Astrologer as Prophet” The Mountain Astrologer Issue # 100 Dec 2001/Jan 2002. Bernadette Brady, Brady's Book of Fixed Stars 1998. Weiser: Boston. Maurice Fernandez. “Crazy Wisdom! The Jupiter-Saturn-Neptune T-square” The Mountain Astrologer # 128 Aug/Sep 2006. Sallie Nichols. Jung and Tarot: An Archetypal Journey. 1980. Weiser: Boston. Pgs. 178-80. Daniel Quinn, Ishmael: An Adventure of the Mind and Spirit. 1992. Bantam Books: New York.